DRIPPER ADJUSTABLE 0-70 L/h ARDAS EMITTING SPIKE RED OR BLACK. Direct connection with micro-tube 6mm. Snap fit 6mm is concluded. Spike length 13,5 cm. 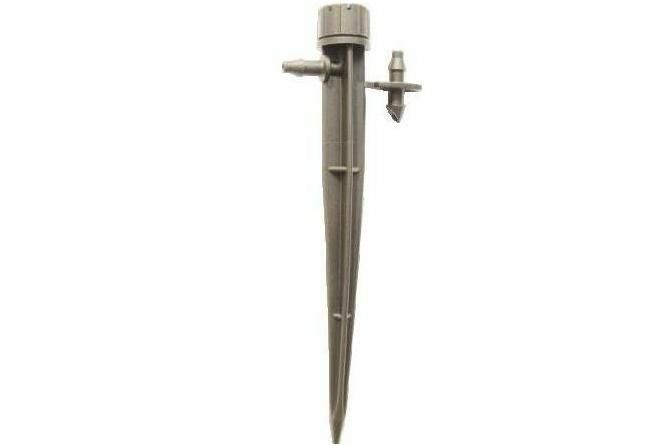 0-14lt/h drip irrigation and 14-70lt/h umbrella irrigation. General: Ideal for trees, pots and flowers. - Can be easily connected with spaghetti hose 6mm or with PE 16-32mm for various irrigation patterns. - Dismantable, removable cap for easy cleaning - Adjustable flow rate over a wide pressure range from 0,5 to 3,0 bar delivers the desirable flow rate. Characteristics: Minimum filtration 80mesh (200micron). Signs (+) and (-) for discharge regulating. One turn / 16 clicks. Safe operation two (2) turns. Droplet irrigation < 14 l/h. “Umbrella” irrigation > 14 l/h. Minimum radius at 1,0 bar 5cm. Maximum radius at 1,0 bar 40cm. Eight (8) irrigation grooves. For installation use punch 3mm.